They're e-mailing, IMing and downloading while writing the history essay. What is all that digital juggling doing to kids' brains and their family life? 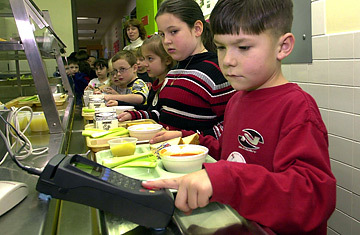 A first grader in Pennsylvania uses a fingerprint scanner to pay for lunch. Then why can we so easily walk down the street while engrossed in a deep conversation? Why can we chop onions while watching Jeopardy? "We, along with quite a few others, have been focused on exactly this question," says Hal Pashler, psychology professor at the University of California at San Diego. It turns out that very automatic actions or what researchers call "highly practiced skills," like walking or chopping an onion, can be easily done while thinking about other things, although the decision to add an extra onion to a recipe or change the direction in which you're walking is another matter. "It seems that action planning--figuring out what I want to say in response to a person's question or which way I want to steer the car--is usually, perhaps invariably, performed sequentially" or one task at a time, says Pashler. On the other hand, producing the actions you've decided on--moving your hand on the steering wheel, speaking the words you've formulated--can be performed "in parallel with planning some other action." Similarly, many aspects of perception--looking, listening, touching--can be performed in parallel with action planning and with movement. The switching of attention from one task to another, the toggling action, occurs in a region right behind the forehead called Brodmann's Area 10 in the brain's anterior prefrontal cortex, according to a functional magnetic resonance imaging (fMRI) study by Grafman's team. Brodmann's Area 10 is part of the frontal lobes, which "are important for maintaining long-term goals and achieving them," Grafman explains. "The most anterior part allows you to leave something when it's incomplete and return to the same place and continue from there." This gives us a "form of multitasking," he says, though it's actually sequential processing. Because the prefrontal cortex is one of the last regions of the brain to mature and one of the first to decline with aging, young children do not multitask well, and neither do most adults over 60. New fMRI studies at Toronto's Rotman Research Institute suggest that as we get older, we have more trouble "turning down background thoughts when turning to a new task," says Rotman senior scientist and assistant director Cheryl Grady. "Younger adults are better at tuning out stuff when they want to," says Grady. "I'm in my 50s, and I know that I can't work and listen to music with lyrics; it was easier when I was younger."